Vasart glass was made in Scotland. Salvador Ysart and his sons Vincent and Augustine started the Ysart Brothers Glass factory in Perth, Scotland, in 1946. They called the glass Vasart, using the initial of each man's first name and the last part of Ysart. 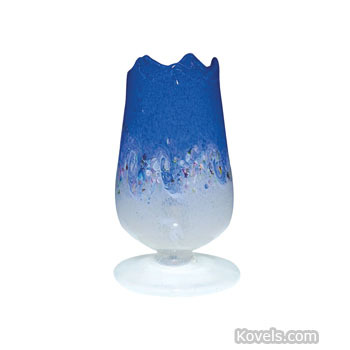 The company name became Vasart Glass Ltd. in 1956. The glass is marked with the acid-etched name Vasart in script or, after 1956, with a paper label. The company was renamed Strathearn Glass in 1965. Stuart Glass bought the company in 1980 and all of the Vasart lines were discontinued. The company's paperweights are the products best known to collectors today. The name Vasart comes from the initials of the three founders, followed by "art," the last three letters in their last name Ysart.